Stop motion animation is often called a lost art, as doing it (or at least, doing it well) is incredibly difficult and time consuming. Every detail on the screen, no matter how minute, has to be placed by human hands hundreds of times so that it looks smooth when played back at normal speed. The unique look of stop motion is desirable enough that it still does get produced, but it’s far less common than hand drawn or even computer animation. If you ever wanted to know just how much work goes into producing even a few minutes of stop motion animation, look no farther than the fascinating work of [Special Krio]. He not only documented the incredible attention to detail required to produce high quality animation with this method, but also the creation of his custom robotic character. Characters in stop motion animation often have multiple interchangeable heads to enable switching between different expressions. But with his robotic character, [Special Krio] only has to worry about the environments, and allow his mechanized star do the “acting”. This saves time, which can be used for things such as making 45 individual resin “drops” to animate pouring a cup of tea (seriously, go look). To build his character, [Special Krio] first modeled her out of terracotta to get the exact look he wanted. He then used a DIY 3D laser scanner to create a digital model, which in turn he used to help design internal structures and components which he 3D printed on an Ultimaker. 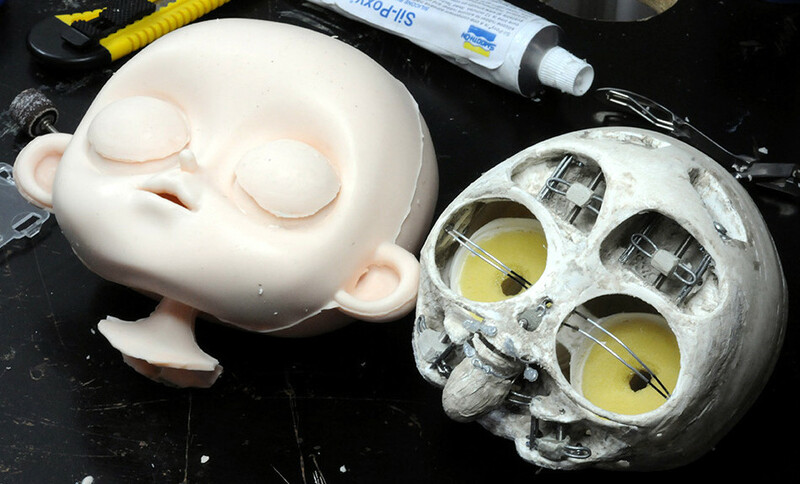 The terracotta original was used once again when it was time to make molds for the character’s skin, which was done with RTV rubber. Then it was just the small matter of painting all the details and making her clothes. All told, the few minutes of video after the break took years to produce. This isn’t the first time we’ve seen 3D printing used to create stop motion animation, but the final product here is really in a league of its own. We’re beginning to think the “S” in [Jeremy S Cook] stands for strandbeest. He’ll be the talk of the 4th of July picnic once he brings out his latest build—a weaponized, remote-controlled strandbeest that shoots bottle rockets. There are a bank of money shots up on Imgur. This ‘beest is the natural next step after his remote-controlled walker, which we featured a month or so ago. Like that one, the locomotion comes from a pair of micro gear motors that are controlled by an Arduino Nano over Bluetooth. The pyrotechnics begin when nitinol wire cleverly strung across two lever nuts is triggered. All the electronics are housed inside a 3D-printed box that [Jeremy] designed to sit in the middle of the legs. We love the face plate he added later in the build, because those gumdrop LED eyes are sweet. Can you believe that this vehicle of destruction began as a pile of innocent, pasta-colored pieces of kit? We dig the camouflaged battleship paint job, ’cause it really toughens up the whole aesthetic. And really, that’s probably what you want if you’re driving around a spindly beast that can just shoot rockets whenever. Let’s light this candle after the break, shall we? Our recent “Retrotechtacular” feature on an early 1970s dead-reckoning car navigation system stirred a memory of another pre-GPS solution for the question that had vexed the motoring public on road trips into unfamiliar areas for decades: “Where the heck are we?” In an age when the tattered remains of long-outdated paper roadmaps were often the best navigational aid a driver had, the dream of an in-dash scrolling map seemed like something Q would build for James Bond to destroy. And yet, in the mid-1980s, just such a device was designed and made available to the public. Dubbed Etak, the system was simultaneously far ahead of its time and doomed to failure by the constellation of global positioning satellites being assembled overhead as it was being rolled out. Given the constraints it was operating under, Etak worked very well, and even managed to introduce some of the features of modern GPS that we take for granted, such as searching for services and businesses. Here’s a little bit about how the system came to be and how it worked. This ambitious goal to literally reinvent the wheel was tackled by Carnegie Mellon’s National Robotics Engineering Center. They delivered the “Reconfigurable Wheel-Track” (RWT) that can either roll like a wheel or travel on its tracks. A HMMWV serves as an appropriate demonstration chassis, where two or all four of its wheels were replaced by RWTs. In the video (embedded below) it is seen quickly transforming from one mode to another while moving. An obviously desirable feature that looks challenging to implement. This might not be as dramatic of a transformation as a walking robot that can roll up into a wheel but it has the advantage of being more immediately feasible for human-scale vehicles. The RWT is not the only terrain mobility project in this DARPA announcement but this specific idea is one we would love to see scaled downed to become a 3D-printable robot module. And though our Hackaday Prize Robotics Module Challenge has already concluded, there are more challenges still to come. The other umbrella of GXV-T is “crew augmentation” giving operators better idea of what’s going around them. The projects there might inspire something you can submit to our upcoming Human-Computer Interface Challenge, check them out!